I had some doubts as to how I should start my blog- it was a toss up between the dock and giving you some general background on how things 'work' out on the open ocean. Sure, it seems simple enough that there was a tsunami that washed things adrift, but it's important (and neat) to understand the why's, where's and how's of it all. Let's start with some oceanography 101. What is a current? How do they work? A current is essentially a flow of water- ocean or other wise, in a set direction. They can come in many flavors, which I'll discuss here. 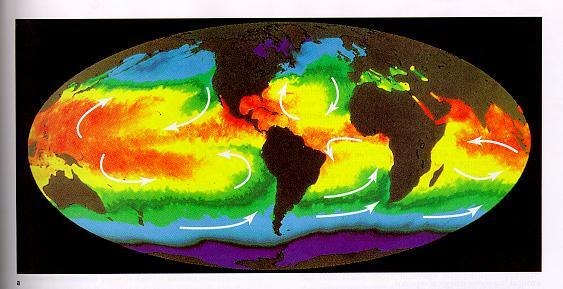 Currents are largely a factor of pressure and temperature gradients set up within our oceans. Cold water shrinks, warm water expands, and thanks to the wonderful balance of the universe, and a principle we call 'conservation of mass', things work themselves out. Add to this the factors of gravity and the earth's rotation on a large scale, and you get what we call Geostrophic currents - currents that occur when water is pulled this way and that by gravity and set up a continuous flow as water rushes in to replace it. In addition, the earth's rotation sets up some interesting things that make the flow of currents across oceans even more complex. One of the most important is the Coriolis Effect. The Coriolis effect is a factor of the Earth's super fast (in human terms) rotation on its axis. Over a large distance, water in the Northern Hemisphere is essentially 'pushed' to the right, creating a clockwise rotation. In the Southern Hemisphere, that is flipped on its head- water is pushed to the left. Here we have a counter-clockwise flow. What's the result of all this (and many other factors)? A complex system of currents that sets itself up around the world. It looks something like this. Earth's geostrophic current system. [earth.usc.edu] Blue arrows indicate cold water flow/source, red indicates warm water. You may notice that Antarctica has its own current surrounding it. That's a whole other can of worms that I really don't want to go into right now, unless people are interested. 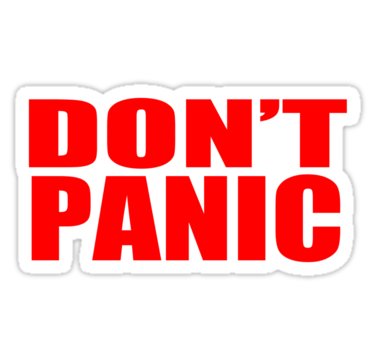 Also note the null forces near the equator, where the Coriolis force is 'in transition'. Anyhow, you can see that there is something elegant and powerful going on here. What you might also notice is that there are several circular areas in which currents cycle. These are what we call gyres- they are essentially giant whirlpools of the sea. You may have heard of the North Pacific, or North Atlantic gyres- the North Pacific Gyre is that infamous 'garbage patch' twice the size of Texas (or not) full of marine debris and plastics (or not- depending on who you ask). Also, be cautious...note that not all sources have their facts very straight. Greenpeace, for example, might be a bit biased in their interpretations. 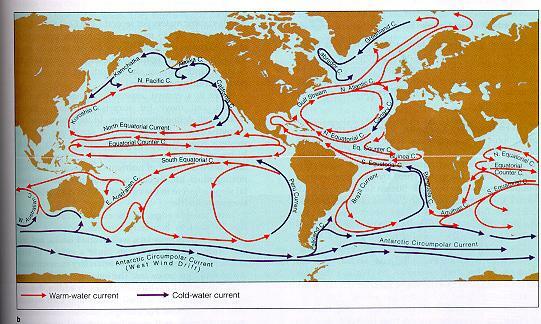 These gyres are where lots of the stuff adrift in the ocean often gets trapped. Over a very large area- so those visions of miles upon miles of solid garbage just aren't true. However that doesn't make them not bad. There are three major problems with these areas: 1) nobody owns them. According to the Law of the Seas, they are owned by all. And who wants to clean up something that doesn't really belong to them? 2) This area is gigantic. It doesn't have a 'physical boundary', so to speak- it is just bounded by water flow. and 3) Imagine millions of bits of tiny plastic floating in water like soup. How on earth do you clean that up? Hopefully someday we can create solutions. 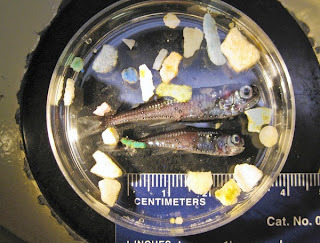 Sad-looking lanternfish and plastic 'nurdles'. However, lanternfish always look sad, no matter the occasion. Okay, so we have this big giant gyre on the North Pacific. Look at those currents- there are two major things that tsunami debris will do leaving Japan. First, it will flow straight on over the North Pacific Current, hop on the California Current Highway, and distribute itself all over North America's west coast. This is already happening. On the other hand, much of the debris is bound to take an exit off that current and get stuck in the Gyre indefinitely. This is bad news for Hawaii, which finds itself right in the middle of that. Okay, so we have the 'why'. We have the 'how'. What of the 'when'? Let's talk current velocities. How is NOAA calculating all of these models in terms of debris arrival? Quite simply, they are creating mathematical models using the basic velocity of that North Pacific current we are talking about. To understand this better, let's do some math (gasp!). The average speed of the North Pacific Current is 10 cm/s...that is 10 kilometers a day. The distance that water is traveling from Japan to the US is approximately 4900 miles, or 7885 kilometers. So.... 4900 miles divided by 7 miles a day is... 700 days. A little less than 2 years. 700 days from March 11, 2011 is about February 11, 2013. Nearly Valentine's Day- I had my suspicions about that holiday anyway. But Shea, if the debris is supposed to hit shores in February, why is it showing up now? The debris that is showing up now simply is highly affected by winds. We call this 'wind drift' or 'windage'. Objects that are light and high in the water are subjected to much more windage than your average debris- the reality is that we are going to have a lot of light stuff washing up now, which will phase into heavier stuff. This explains why we had a giant floating dock (which I'll talk about next time) show up on our shore, and why beachcombers like myself are finding floats and water bottles on the beach. How much of an impact does wind have? I'll share an example with you that I learned in class last term. Let's add wind as a tiny (1%) factor of our equation. Your average ocean wind is at about 20 knots- that is 20 nautical miles per hour, or 23 miles per hour for us landlubbers. This blows 552 miles a day. So I hope now the mechanics of this makes a bit more sense- I think it's important to understand why things happen the way they do, and if nothing else it is something to impress your friends with at the bar tomorrow. I'll give you a break with the physics stuff for now. Next up: a bit more about that dock. Then after that, I think I'll talk a bit about how earthquakes and tsunamis work. PS: If you'd like more basic information on Earth's current system, check out USC's Currents Page.